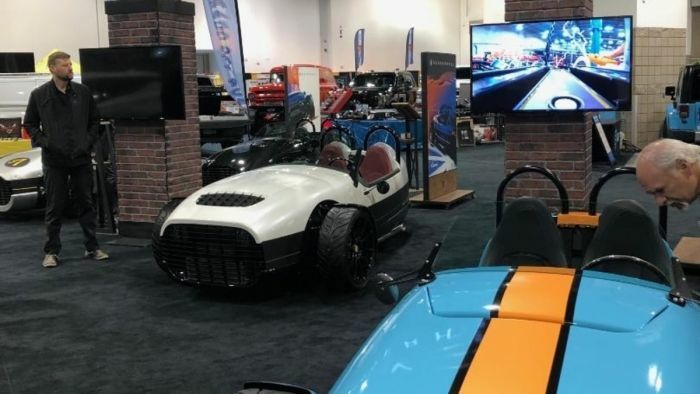 One of the most interesting displays at this year's set of auto shows, is from a Utah company called Vanderhall. If you are looking for a retro-looking fun vehicle, Vanderhall may have the answer. If you love the looks of classic racing cars and want great handling without the hassles of owning a vintage motor car, you should check out the sleek Vanderhall models. I was able to see them at the Denver Auto Show. Vanderhall is making appearances at this year’s different auto shows. The 3-wheeled vehicles will give you the power sports feel with a classic look. Vanderhall Motor Works is based in Provo, Utah. Their roadsters are built in their Provo facility. The vehicles feature a aluminum chassis with a composite body and a 1.4 or a 1.5 liter, 4 cylinder turbo charged engine mated to a 6 speed automatic. The roadsters are all front-wheel drive. This year Vanderhall is adding a vehicle that will have a removable hardtop to make it better for all sorts of weather. The least expensive model in the Venice Speedster. The single seater starts at $26,950. The vehicles come with heated seaters and heaters to keep you warm despite the open-air drive. The Venice is a two-seater that claims to go up to 140 MPH. The Venice runs on premium unleaded and uses a General Motors Multi-port injected engine. It promises to kick out 180 horsepower and runs on premium unleaded fuel. It even has a catalytic converter. The steering is GM rack-and-pinion with electronic assist. The Venice can be ordered in 4 different colors, including Raven Metallic, Gunmetal Metallic, Ruby Metallic, Pearl White. The Venice starts at $ 31,950, but upgrades are available. There is an electric model available called the Edison that promises a range of 200 miles. The Edison will sell for $34,950 can be ordered with a deposit of $1000. The top of the line model is called the Carmel. According to the Vanderhall website, “The Vanderhall Carmel brings more luxury and convenience to the Vanderhall lineup. With front entry doors, a wider cabin and provisions to accommodate an optional removable canvas cap shade, the Carmel promises additional class and comfort for your journey.” The Carmel starts at $39,950. It is nice to see other manufacturers get in to the 3-wheeled-market. The Vanderhall models add elegance to the segment that is often defined by more motorcycle-looking vehicles. The automatic transmission should make them fun to drive as well. The Vanderhall website is filled with videos and news stories about its innovative vehicles. It even includes a video with Jay Leno from his Jay Leno’s Garage series. The proof of the company’s success will be in its sales. The appearances at auto shows should help boost the company’s publicity. Hopefully, it is enough to keep the niche vehicles in the market!